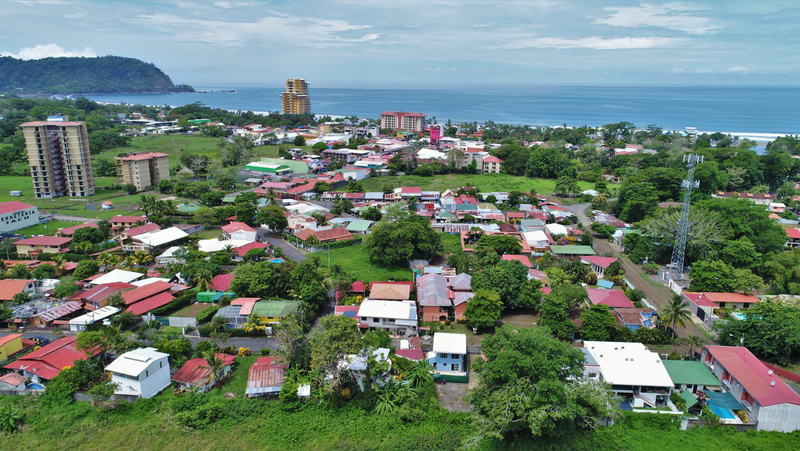 Las Nubes residential is located in Herradura, Costa Rica. This gated residential community consists of several identical town houses located on two streets in the neighborhood. The two story townhouses have 3 bedrooms and 2 ½ bathrooms. The construction area of the homes is 160m2 and the lot area is 214m2. The open kitchen with wood cabinets is next to the living room and sliding doors open up to the patio and backyard. The bedrooms and bathrooms are on the second level. The townhomes at Las Nubes have a parking space and a one car garage with automatic door opener and there is a separate laundry area. Las Nubes is a family oriented residential and a great real estate option for families who want to live in Costa Rica. The community has great internal roads with sidewalks and well maintained green areas. There is a community pool with rancho area. The neighborhood has a gated entry with 24 hour security. Located within Las Nubes premises is a private bilingual elementary school. Las Nubes School is well known by the people in the area. Because the school is located in the community a lot of families enjoy living in Las Nubes. Besides being a family oriented residential Las Nubes is also pet friendly! Due to Las Nubes’ location between Jaco and Herradura you have easy access to both towns and their beaches. Several supermarkets are nearby as are banks, stores, medical services and many other amenities. Many restaurants and bars are situated in Jaco and there is a movie theater. The beach town of Jaco offers activities for young and old. Surfing is definitely one of the most popular in Costa Rica and the waves in front of the beach in Jaco are perfect for beginners or more advanced surfers. There are plenty of ways to enjoy the tropical climate and nature that is Costa Rica.